The androgen receptor gene is more than 90 kb long and codes for a protein that has 3 major functional domains: the N-terminal domain, DNA-binding domain, and androgen-binding domain. 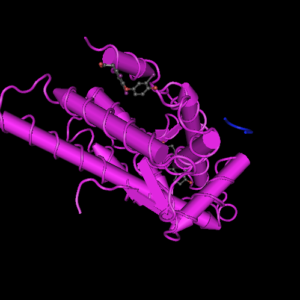 The protein functions as a steroid-hormone activated transcription factor. Upon binding the hormone ligand, the receptor dissociates from accessory proteins, translocates into the nucleus, dimerizes, and then stimulates transcription of androgen responsive genes. This gene contains 2 polymorphic trinucleotide repeat segments that encode polyglutamine and polyglycine tracts in the N-terminal transactivation domain of its protein. Expansion of the polyglutamine tract causes spinal bulbar muscular atrophy (Kennedy disease). 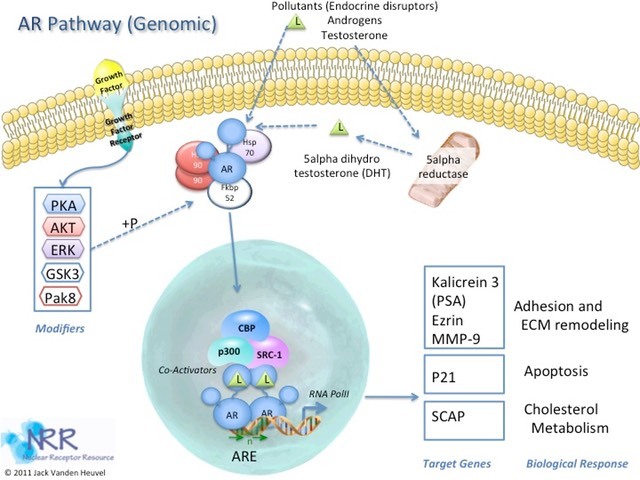 Mutations in this gene are also associated with complete androgen insensitivity (CAIS). Two alternatively spliced variants encoding distinct isoforms have been described. There are 1154 articles specifically referring to this gene in PubMed. 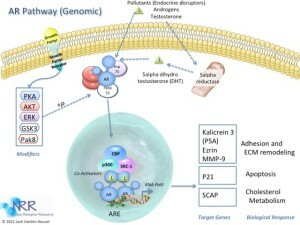 Functionally, the gene has been tested for association to diseases (Adenoma, Pleomorphic; Adrenal Hyperplasia, Congenital; Alopecia; Alzheimer Disease; Androgen insensitivity; androgen insensitivity, partial; Androgen insensitivity, partial, with or without breast cancer; Autistic Disorder; Biliary Tract Neoplasms; Breast cancer, male, with Reifenstein syndrome and 54 others), proposed to participate in pathways (Oocyte meiosis, Pathways in cancer, Prostate cancer) and processes (activation of prostate induction by androgen receptor signaling pathway, cell death, epithelial cell differentiation involved in prostate gland development, in utero embryonic development, lateral sprouting involved in mammary gland duct morphogenesis and 17 others). Proteins are expected to have molecular functions (metal ion binding, POU domain binding, receptor activity, zinc ion binding) and to localize in various compartments (membrane, nucleus, axon, cytoplasm, dendrite). Putative protein interactors have been described (AES, AHR, AKT1, ANKRD35ANDPIAS3, APOL2, APPBP2, AR, ATF2ANDCHN1, BAG1, BRCA1P1 and 168 others). Over 190 Diseases associated with this receptor. Please see HuGENavigator for more information. The gene contains 13 distinct gt-ag introns. Transcription produces 6 alternatively spliced mRNAs. There are 2 probable alternative promotors, 3 non overlapping alternative last exons and 3 validated alternative polyadenylation sites (see the diagram). The mRNAs appear to differ by truncation of the 3' end, presence or absence of 4 cassette exons. Note that mRNA .eAug10 was found in vivo, although it is a predicted target of nonsense mediated mRNA decay (NMD). Efficacy of translation may be reduced by the presence of a shorter translated product (uORF) initiating at an AUG upstream of the main open reading frame (in variant aAug10).